Accessories - Buy online, direct from the manufacturer. Get The Best Priced 800 Gauge Polytunnel Polythene! Time To Re-Sheet Your Polytunnel? We're the One-Stop-Shop for your re-sheeting requirements. Get all the bits you'll need, all in one place. Polythene, battens, nails, anti hot spot tape - All available in one location for your convenience. Robinson Polytunnels give you . . .
HIGH STRENGTH "Z35" galvanised steel framework. As used in the manufacture of only the best polytunnels. 5 YEAR POLYTHENE GUARANTEE against UV degradation and manufacturing faults. All our polytunnels are supplied with 800g polythene - the thickest horticultural polythene available in the UK. Read more about our range of Polythene. Our polytunnel ground tubes are made from THICK-WALL, HEAVY-GALVANISED steel tube for increased corrosion resistance where it's most needed. All our timber is TANALISED for protection against rotting. Read more about Tanalith E preservative. ROBUST BRACKETS - Not like the flimsy polytunnel brackets provided by many of our competitors! We use THICK BATTENS - 1 ½" x ¾", twice the size of many of our competitors and essential to hold your polytunnel cover securely in place. LOW PRICES are standard from Robinson Polytunnels. Our competitors rely on special offers to come close to our prices! FAST DELIVERY ! - Most orders are dispatched the next working day by Next-Day or 3-Day Delivery Service. Free delivery for most orders over £150. We aim to provide you with an exemplary service and hope that you will enjoy browsing our online store pages to find your polytunnel or fruit cage. All our polytunnels and fruit cages are provided with simple yet comprehensive instructions and we are always just a phone call away. Our staff are experts in polytunnels and fruit cages and will provide accurate information and sound advice. 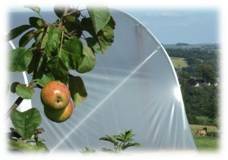 Click here to view our range of polytunnels, fruit cages and accessories on our store pages. Robinson Polytunnels manufacture and supply polytunnels, fruit cages and accessories to hobby growers and professionals throughout the UK. Our polytunnels have been designed for ease of build whilst maintaining the robustness required to withstand weather conditions throughout the UK. We have looked closely at each detail of our polytunnels to ensure you can utilise your 'tunnel to its full potential. Here at Robinson Polytunnels we manufacture and distribute the best quality polytunnels to many clients, from avid gardeners to professional growers, NHS Trusts, Schools and Council Authorities. With a wealth of experience in the design and construction of first class polytunnels, we offer a selection of sizes to suit an array of gardens and allotments. Every effort has been made to ensure the longevity of our products from the galvanising of metal parts and tubing to the treating of timber frames to reduce, if not banish, the risk of rot or rust. You can instantly see and feel the quality items that we manufacture, creating a sturdy, strong polytunnel environment for many cultivators and gardeners across the UK. We are the one place to find the perfect polytunnel right here at Robinsons. Poly tunnel, polytunnel, polly tunnel, pollytunnel - It doesn't matter how you say it . .
Whatever your garden or allotment layout, the addition of raised beds can be an aesthetic addition that can also mean flowers or vegetables can be grown at whatever height required, especially handy for senior gardeners with less mobility. Providing the right products to create ideal environments for growing fruit, vegetables, plants and flowers, here at Robinson Polytunnels we present everything you need to create the perfect Raised Garden Beds for you.